Resilience. That’s the key word the Ottawa 67’s are becoming synonymous with. That and the ability to produce stirring performances in the closing stages of the game. The Hamilton Bulldogs got a taste of that medicine during Ottawa’s 5-4 win in the second game of the OHL Playoffs on Sunday. 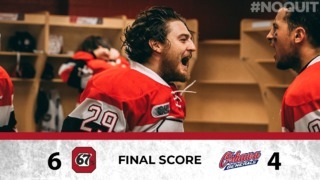 The Barber Poles grabbed a crucial road victory to tie the Playoffs battle at a game each with the next two games at home at The Arena at TD Place. 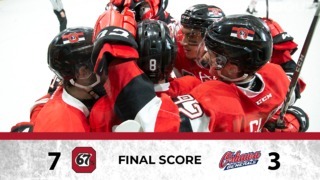 The 67’s had produced a similar gritty performance in their first playoff game but couldn’t close out that one, though it was a solid road performance to open a series. In the second game they showed the tenacity to force the win and head into the two home games brimming with confidence. 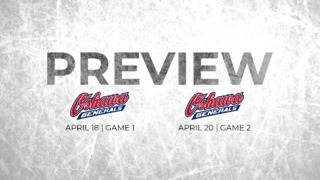 Heading into the playoffs, the talk has been about the 67’s top line – Travis Barron, Sasha Chmelevski and Tye Felhaber – being the big threat. But Head Coach André Tourigny will be happy that the rest of the team is also stepping up and delivering when it matters. Chmelevski and Barron were on the scoreboard but Shaw Boomhower took the spotlight with a two-goal performance Sunday, while Sam Bitten notched the winning goal. The battle of the Bitten brothers currently has the younger one ahead in goals scored (Sam 2 – Will 1). 67’s defenceman Noel Hoefenmayer was on his A-game again, providing three assists. He now has three points apiece in the first two playoff games. Goaltender Olivier Tremblay put his hand up with 31 saves, including crucial saves in the first and third period when the Bulldogs were on the attack. Tremblay pulled off 12 saves in the first period and 11 in the third. It was a comprehensive performance by the team that finished the regular season in eighth place against the team that won the Eastern Conference. They will take confidence from that victory and look to replicate the wins on home ice.